Nine Provincial titles decided on a sun-drenched day of thrills, spills and passionate rugby. Abbotsford, BC – May 5, 2018: Under a blistering sun and cloudless skies, hundreds of rugby players and fans descend on Abbotsford’s Exhibition Park for the 2018 BC Rugby Club Finals. A total of nine Senior Division titles were decided in an action-packed 8hrs, with teams from 11 clubs from Island to Interior battling it out on the fields. The culmination of a long season of competition, for some teams in excess of 20 matches in the making, the victories were celebrated with jubilant screams that hinted at just how much these titles mean to both players and clubs. The Men’s Premier League Final, sponsored by Onni, is always one of the highlights of the event and this year’s match did not disappoint. A crunching match between three-time defending champions UBC Thunderbirds and neighbours UBCOB Ravens RFC was filled with blistering runs, slick passing and an incredible level of intensity throughout. In the end, it was the Ravens players and fans whose cheer of delight tore through the air at the final whistle. It took everything they had to secure a 16-10 win against a UBC side that was an ever-present threat and left little room for error. Raven’s number 11, Cully Quirke, explained “It’s been such a treat to see the rise of the club in the last two years. What really feels good is knowing what this means to the people who have been here the longest, both players and supporters. 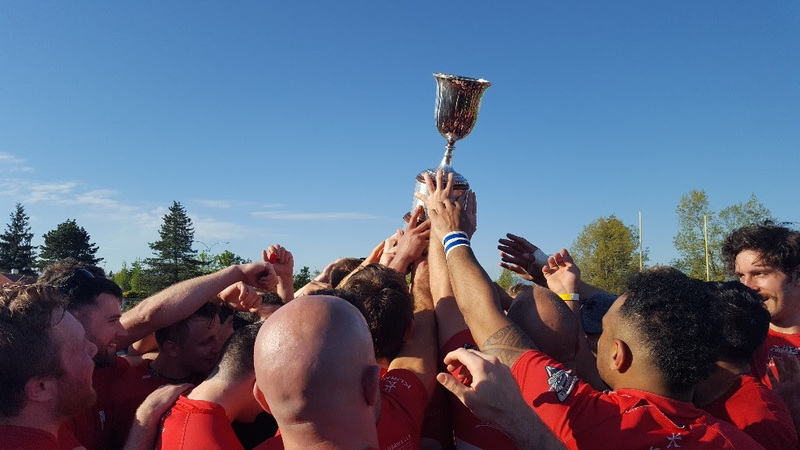 Seeing the smiles on their faces, it’s a real treat.” This was UBCOB Ravens RFC’s sixth experience lifting the Rounsefell Cup and their first since the 1993/94 season. In the late afternoon light, former Rugby Canada Men’s Captain and Director of the Canadian Rugby Foundation, Hans de Goede, along with current Men’s Nation XVs coach Kingsley Jones, were on hand with BC Rugby President Samantha Shorter to present the historic trophy to a euphoric UBCOB Ravens team. Elsewhere, the inaugural final of the Men’s U23 Division was won by United RFC Academy, sealing a comprehensive 64-5 win over Capilano RFC Academy. The Men’s Division 3 was won by Westshore RFC in a highly charged match against Capilano RFC. The match was well supported by passionate fans on both sidelines and they were not short of entertainment in the 33-22 match. The Women’s Division 1 title went to Meraloma Rugby Club, defeating a spirited Bayside Sharks RFC by 29-12. “We’ve worked so hard this year,” said Meraloma’s Rebecca Haber. “Some of us have been with the club for a long time and some have just joined recently. It has been amazing to see how the team has gelled and developed through the season. Bayside was always going to be a super tough opponent and we’re just delighted we were able to come out on top today”. One of the closest finals of the day saw the Men’s Division 2 title contested by Kamloops Rugby Club and Vancouver Rowing Club. A nail-biting fixture, both teams traded the lead before Kamloops secured the win by just a single point, 28-27. “My heart almost fell out of my chest a couple of times,” said Kamloops’ Steve Thomson. “We’ve got our club’s 50th anniversary tonight and a brand new clubhouse, so I can’t think of a finer way to add to the celebrations”. Meanwhile, in the Men’s Division 1 final, Vancouver Rowing Club sealed a comprehensive 42-6 win over Bayside Sharks RFC. Having watched their teammates lose so narrowly just moments before, the Rowers executed a confident display and controlled the game throughout. The Men’s Premier Reserve saw an explosive battle between UBCOB Ravens RFC and Meraloma Rugby Club. The speed and skill on display belied the fact that these were the clubs B teams and both teams put in a fiercely passionate and commendable performance. In the end, it was Meraloma who edged the final result, winning 22-20. 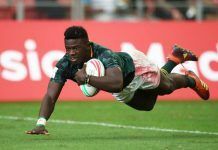 “Those last minutes felt so long,” said Meraloma’s Oliver Owen “but we just stuck to our game plan and believed in our abilities”. BC Rugby would like to thank all of its sponsors, particularly Onni, for their continued support of the sport. Equal thanks must be extended to the army of match officials, coaching staff, medical staff, volunteers and all other supporters and fans who made the 2018 BC Rugby Club Finals such a success.